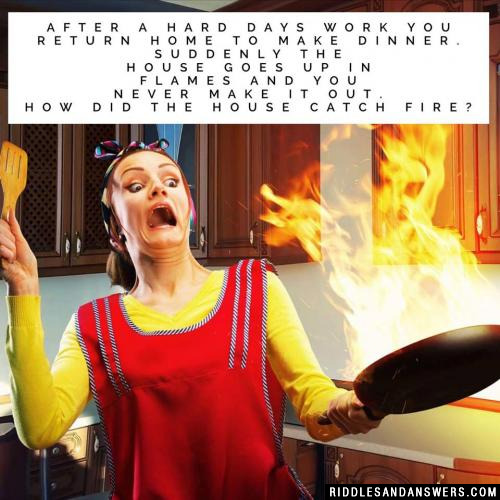 When does your dinner never get hot? Hint: Anyone for dinner? Anyone! The opening lines refer to a guest's role in dinner - as the main course! 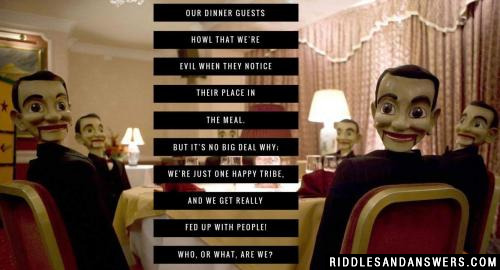 "Tribe" and the pun, "fed up", are the main clues. What's a scaredy cat's favorite dinner? After a hard days work you return home to make dinner. Suddenly the house goes up in flames and you never make it out. How did the house catch fire? You are a smoker and as soon as you turned on the gas the gas ignited and burned the house. What do spiders eat with their dinner? Can you come up with a cool, funny or clever Dinner Riddles of your own? Post it below (without the answer) to see if you can stump our users.